Twitter – known for the best micro-blogging platform from quite a long time. Everyone seems to love update their status and useful links on Twitter. Personally for me, it’s a platform where I share my thoughts and quality information with my friends and followers. Twitter is basically balance between your updates, gaining followers and understanding your importance on social platform. However, to judge your importance on Twitter, you have to constantly track your unfollowers. Being unfollowed on Twitter is a part of the microblogging platform but not to take it personally is surely a hard think to do. You cannot help it, but surely track who stops following you and potentially why they choose to unfollow you. There are many third party tools that allows you to get notifications when someone clicks the unfollow button and let you know the timeline of tweets that might help you to figure out where you went wrong with your status updates or links. In this article, I am going to jot down the best free twitter unfollower tools that send notifications when someone unfollow you on twitter. Here’s the compilation of Top 7 twitter free tools to track people that stopped following you. Let us know which tools you are using to track Twitter unfollowers in the comments section below. Alternatively, check out our previous compilation of best free twitter tools compiled by Jaspal Singh few days before. 1) Qwitter : UseQwitter sends you a summary email at least once a day informing you of those who have stopped following you on Twitter. This service has two subscribing options – 30 days free trial and premium account. 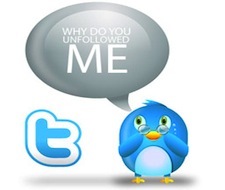 2) @unfollowr : @unfollowr is the twitter service that helps you to track people that stopped following you. You will receive digests to your email or direct messages with list of unfollowers (including accentuated ex-friends) or link to a digest as direct message in twitter. All your need is to follow @unfollowr. 3) Goodbye, Buddy : Goodbye, Buddy! 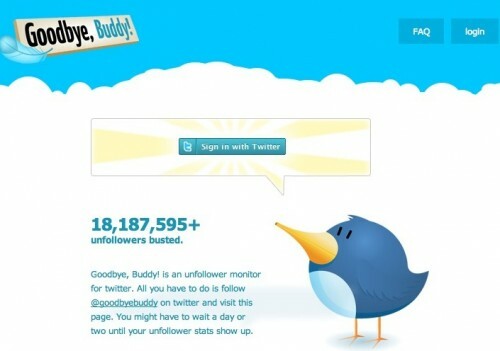 is an unfollower monitor for twitter. All you have to do is follow @goodbyebuddy on twitter and visit this page. You might have to wait a day or two until your unfollower stats show up. 4) twunfollow : TwUnfollow notifies you about Twitter followers that are not following you any longer. At the moment service check the followers about four to five times a day. 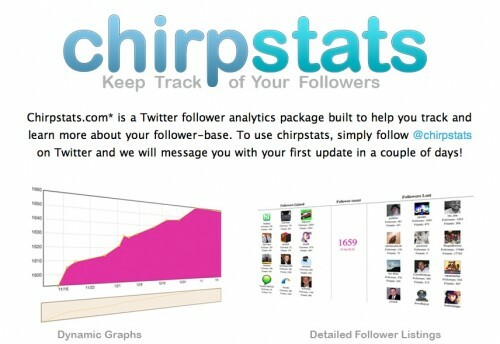 5) Chirpstats : Chirpstats.com formerly known as twitterless.com is a Twitter follower analytics package built to help you track and learn more about your follower-base. 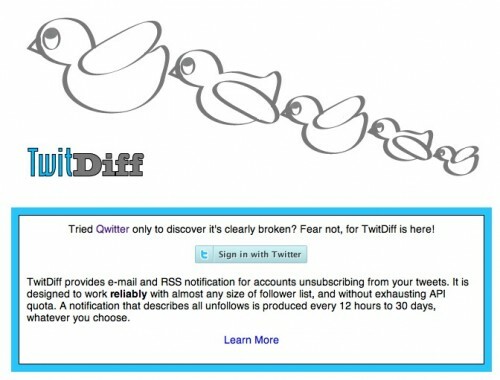 6) TwitDiff : TwitDiff provides e-mail and RSS notification for accounts unsubscribing from your tweets. It is designed to work reliably with almost any size of follower list, and without exhausting API quota. A notification that describes all unfollows is produced every 12 hours to 30 days, whatever you choose. 7) Twitta Quitta : Twitta Quitta is a brand new service. 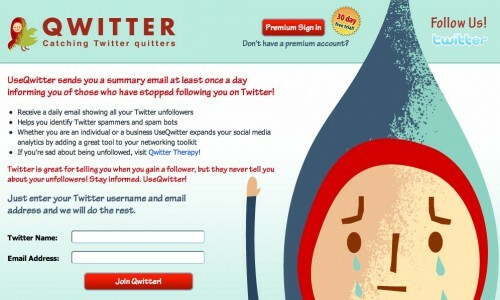 It will catch all twitter quitters who stopped following you on twitter and send you an email every day for a quick update.